Experience the tranquil side of Waikiki at this peaceful retreat uniquely located along the exclusive "Gold Coast" at the foot of Diamond Head and Kapiolani Beach Park. Every guest room offers remarkable views of Diamond Head and the ocean can be enjoyed from its premium rooms. Each room features high-speed internet access, mini refrigerator and iPod clock/radio dock station. Expect a relaxed, calm atmosphere, away from the typical fast-paced Waikiki scene, yet conveniently accessible and within walking distance. The Waikiki Aquarium and Zoo are nearby. 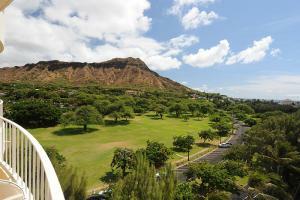 Adjacent to two beaches, across from Kapiolani Park, 13 miles from the airport.